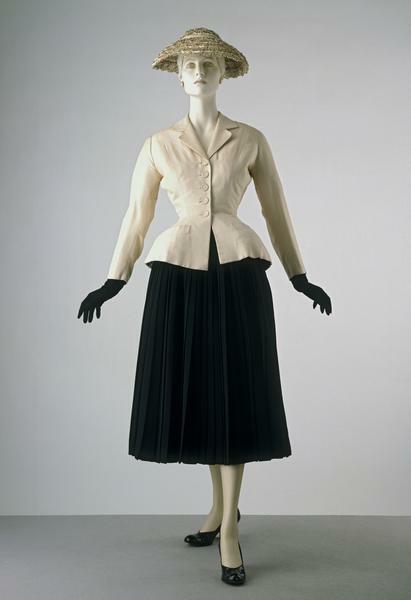 This 'Bar' suit was one of the most popular models in Dior's first collection, which he called 'La Ligne Corolle'. The press dubbed it the 'New Look' and the name endured. 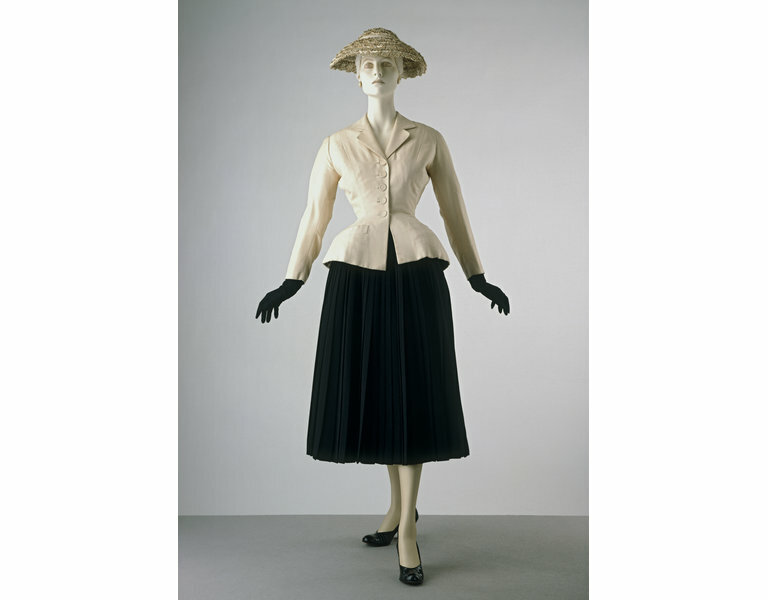 Dior (1905-1957) took the softer feminine shape - round, sloping shoulder-line, narrow waist and spreading skirts - to the extreme. Despite official complaints it was a resounding success. Harper's Bazaar published detailed line drawings of the New Look's construction, and 'Bar' was also illustrated in Vogue and L'Officiel. Woman's suit consisting of a jacket in natural coloured tussore silk, and wool crêpe and taffeta skirt. The jacket is hip length, waisted and tightly fitted to the figure. Fastens with three self-covered buttons at the centre front. There are pockets on the hips. The collar and lapels are tailored. The lining is of cream silk and the hips are padded. The skirt is of fine black wool crêpe, fully pleated and mounted on a stiffened taffeta petticoat. The waistband is of quilted silk shaped to throw the waist out from the hips. Fastens at the centre back with hooks and eyes and snap fasteners. 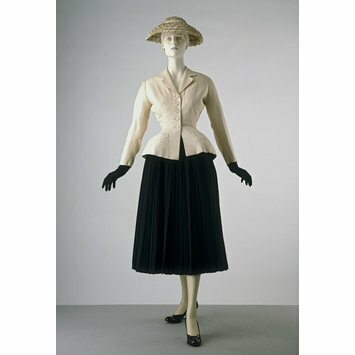 This coat, skirt and hat were given to us by 'Christian Dior Paris' (30 Avenue Montaigne), in response to our request for a typical "New Look costume". The donation was facilitated by Cecil Beaton, who contacted Dior on the musuem's behalf. In the customs declaration form filled out by 'Christian Dior Paris' the skirt material is described as 'fibranne/laine', the jacket as 'shantung grege soie'. It is possible that this suit is a 1950s remake of the 'Bar' suit, possibly created for Christian Dior's 1955 lecture at the Sorbonne. The famous image of the Dior house model Renée, standing on a cobbled street along the banks of the Seine taken by Willy Maywald, has been dated by the Maywald Archive as 1955, not 1947. Dior launched his new house on 12 February 1947 and became an overnight sensation. His voluptuous collection was the antithesis of lean, boxy wartime fashions. Instead, feminine designs featured rounded shoulders, a womanly bust and a hand-span waist above enormous skirts. It was christened on the spot by Carmel Snow, editor of American Harper's Bazaar, as the 'New Look'. The amount of fabric required to create a New Look garment - typically 15 metres in a woollen day dress, 25 metres in a short taffeta evening gown - caused outrage, for rationing was still in place. The collection was shown in secret to Princess Margaret at the French Embassy in London. But despite attempts by the Board of Trade to suppress it, the New Look was unstoppable. Published in Four Hundred Years of Fashion, V&A, 1984, cat 169. Published in V&A: A Hundred Highlights, V&A Publications, 1996. 'Bar' is one of the most important designs from Dior's first collection. The tight-fitting jacket is corseted, while the hip pockets add width. The long pleated black wool skirt, padded with cambric, is exceptionally heavy. To record the designs for his collections, Dior created first notebooks, then charts. At this stage they simply included a sketch and technical specifications for the type and quantity of fabric, though later they became more complex. This information helped Dior to price the designs. 'Bar' cost 59,000 francs. The jacket required 3.7 metres of silk shantung and was fastened with five hand-stitched buttons. The suit is possibly a 1950s remake of the famous Spring 1947 'Bar'.